Delivered Cheyenne 22/10/43; Walla Walla 9/11/43; Assigned 728BS/452BG [9Z-O] Deopham Green 3/1/44; return from mission 26/3/44 with Herman Beuchat, Co-pilot: Everett Phillips, Navigator: Capt Art Miller, Bombardier: Bob Davis, Bombardier: Lt Jack Miller (KIA-died in nav’s arms), rest unknown; Missing in Action Bordeaux 19/6/44 with Clark Graham, Co-pilot: Bob Jones, Navigator: Chas Weinberger, Bombardier: Herb Fletcher, Flight engineer/top turret gunner: Wayne England, Radio Operator: Jim Warnick, Ball turret gunner: Bob Stittsworth, Waist gunner: Gordon Hansen, Waist gunner: Jesse Roberts,Tail gunner: Bill Holmes (10INT); flak hit in #1, the #2 failed, force landed Luceni, near Zaragoza, Spain. Missing Air Crew Report 5931. DOG BREATH. My father was on this plane. Navigator…Carl L Thomsen. 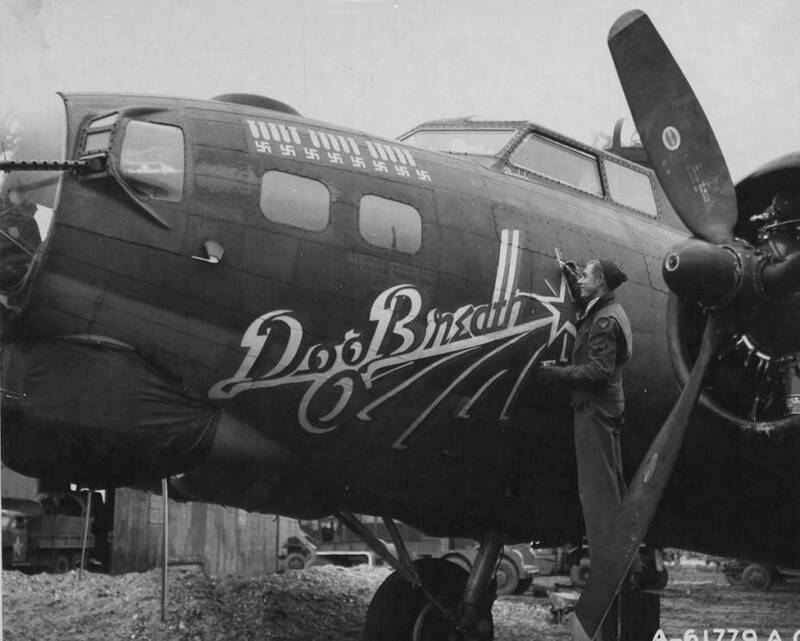 My Father-in-Law, James B. Pinson was the pilot of this B-17 (Dog Breath)..